I regard this book as one of the most significant publications on Cacti of recent years. Based on very extensive field work it gives extremely detailed knowledge of all species of cacti to be found north of Mexico. It is extensively illustrated with both black and white and colour photographs. The very detailed distribution maps make the volume essential reading for anyone wishing to search for cacti in habitat. Highly detailed keys and botanical drawings of flowers, spines, seed pods, seeds, body and root structures assist in the indentification of plants. 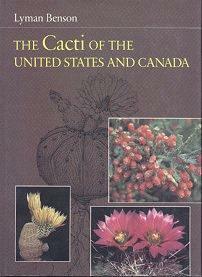 Chapters are included on the history, geography and ecology of cacti making this volume a mine of information. The only regret is that similar volumes are not available for the cacti of Mexico and South America. This work was published by the Stanford University Press.